Alaska Airlines Flight 261 departed Puerto Vallarta at about 14:30 PST for a flight to San Francisco and Seattle. En route to San Francisco a FL310 a problem arose with the stabilizer trim. At 16:10 the crew radioed Los Angeles ARTCC that they were having control problems and that they were descending through FL260. At 16:11 Los Angeles ARTCC asked the condition of the flight and were told that they were troubleshooting a jammed stabilizer. The crew requested, and were granted, a FL200-FL250 block altitude clearance. At 16:15 the crew were handed off to Los Angeles sector control. The Alaska Airlines crew reported problems maintaining their altitude and told their intentions to divert to Los Angeles International Airport. They were cleared to do so at 16:16. The crew then requested permission to descend to FL100 over water to change their aircraft configuration . Los Angeles cleared them to FL170. Last message from Flight 261 was when they requested another block altitude. The request was granted at 16:17, without a readback from the crew. During the descent the crew was also talking to Alaska Airlines maintenance personnel in Seattle and Los Angeles to troubleshoot their stabilizer trim problems. As the crew attempted to diagnose or correct the problem the out-of-trim condition became worse, causing a tendency for the plane to pitch nose-down. When preparing the plane for landing control was lost and the MD-83 was seen 'tumbling, spinning, nose down, continuous roll, corkscrewing and inverted'. The aircraft crashed off Point Mugu in 650 feet deep water. PROBABLE CAUSE: "A loss of airplane pitch control resulting from the in-flight failure of the horizontal stabilizer trim system jackscrew assembly’s acme nut threads. The thread failure was caused by excessive wear resulting from Alaska Airlines’ insufficient lubrication of the jackscrew assembly. Contributing to the accident were Alaska Airlines’ extended lubrication interval and the Federal Aviation Administration’s (FAA) approval of that extension, which increased the likelihood that a missed or inadequate lubrication would result in excessive wear of the acme nut threads, and Alaska Airlines’ extended end play check interval and the FAA’s approval of that extension, which allowed the excessive wear of the acme nut threads to progress to failure without the opportunity for detection. 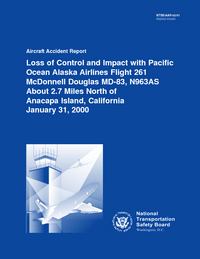 Also contributing to the accident was the absence on the McDonnell Douglas MD-80 of a fail-safe mechanism to prevent the catastrophic effects of total acme nut thread loss." Distance from Puerto Vallarta-Gustavo D. Ordaz Airport to San Francisco International Airport, CA as the crow flies is 2489 km (1556 miles).